SoftList is the material quantity and cost estimate part of SoftPlan. As a design is being drawn, SoftList is counting materials and adding them to the list. cost estimate reports that include a host of export and print options. As SoftList can perform calculations from items on the drawings other use reports can be generated. SoftList is supplied with a variety of preconfigured, ready to use reports. Lighting Load - Calculates the watts / m2 for 3 zones on the plans. Site Coverage - Reports pecentage of non - permeable area compared to total site area. 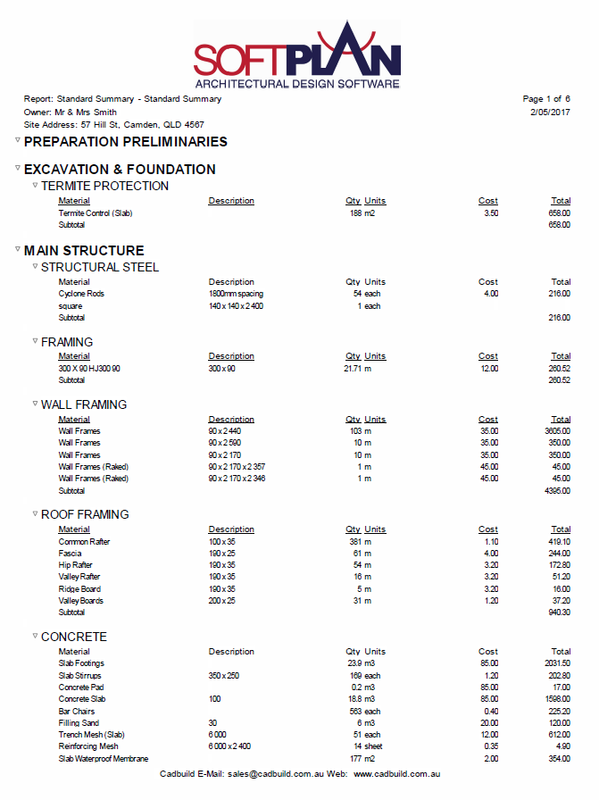 Site Details - This Report displays values of length width and volume of site items where applicable. These special reports are in addition to the Standard Summary and Detailed material report formats. The header, image, and footer information is customisable to reflect your company details.